One major Science Fiction trope Star Trek uses over and over again is that of time travel. We always find the crew of whatever ship visiting whatever time the show actually aired in, and seeing the reactions of the characters in a different time. Other times, we hear stories of the past – stories of events and people who shaped a world where flying to other planets in spaceships is commonplace. These stories seem littered across time in the Star Trek universe, until now, not connected by anything other than actually being in the Star Trek universe. 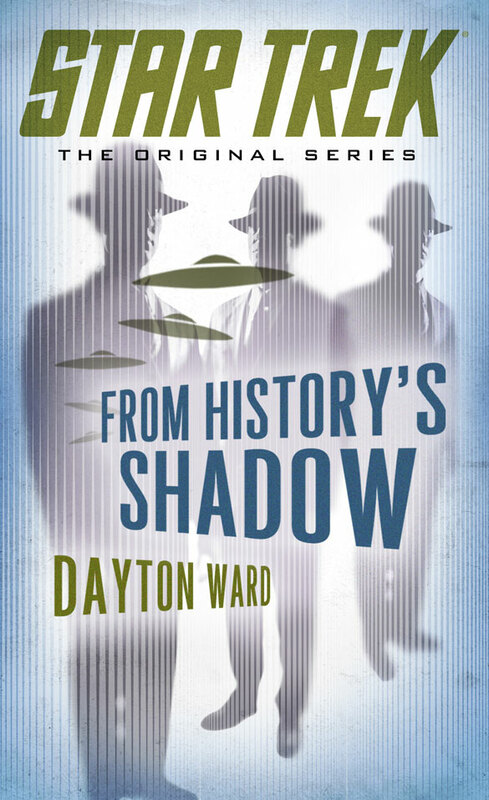 Dayton Ward’s new book “From History’s Shadow” throws us into the mix on the heels of the Original Series season two finale Assignment: Earth, where the crew of the Enterprise encountered Gary Seven, a man out of time. Two intruders have mysteriously beamed aboard the Enterprise. In the line of questioning the intruders, we are taken back to the events that follow the Deep Space Nine Episode Little Green Men, where Quark and a few other Ferengi end up on Earth mid-World War II. We are shown the development of the Majestic Twelve and Project Blue Book, both are efforts by US Military to follow up on the potential for alien invasion. The text seamlessly ties together a number of other episodes from Star Trek canon, including Enterprise’s Carbon Creek, The Original Series Tomorrow is Yesterday and even Voyager’s famous Future’s End two-parter. The result is a well-structured world with characters steeped in Star Trek mythology and focused to a fine point. The balancing act of this book is that it is structured as a Original Series book, but less than a third of the text takes place on-board the Enterprise, or even with the Enterprise crew. All-in-all, an enjoyable book that ties together a number of puzzle pieces left long hanging. I highly enjoyed and would recommend this title to Trekkies and non-Trekkies alike, as the book really does let you in on the ground level of the story – you do not need to have fore-knowledge of any of the episodes to understand the book. Star Trek: The Original Series: From History’s Shadow by Dayton Ward (ISBN 978-1476719009) is published in paperback by Simon and Schuster. It can be bought at your local retailer or online for $7.99. This entry was posted on September 18, 2013 by Nathanial in Book Reviews and tagged 1701, Book Review, books, Captain Kirk, Dayton Ward, From History's Shadow, Kirk, Mestral, NCC-1701, Paperback, Sci-Fi, Science Fiction, SciFi, SF, Simon & Schuster, ST, Star Trek, Star Trek: The Original Series: From History's Shadow, The Original Series, USS Enterprise.